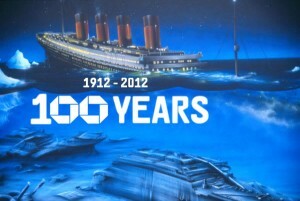 April 14 2012 marks Titanic’s 100th anniversary. The sinking of the RMS Titanic is one of the largest peacetime maritime tragedies in history. Titanic Universe remembers the lives lost on that day and the historical icon that the Titanic has become to the world. We have gathered the most information possible to bring our readers the complete story of the Titanic construction to Titanic wreckage as well as little known facts about the night of April 14, 1912. Remember the historical event and check out our photos, stories, and facts surrounding the Titanic Anniversary. Update: The Titanic 100th Anniversary Coin has been released. You really ought to check out this piece of Titanic history. 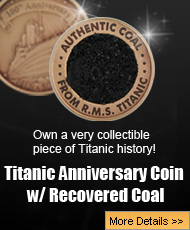 It’s elegant design is comprised of actual coal recovered from the Titanic! On April 14, 2012, there will be flower lying at the former Ashley and Burnap homes where domestic Janie Carr worked and lived. A tour of the historic Dr. Sidney R. Burnap Home at 18 Maple Avenue will be conducted will proceeds going for the preservation of the historic train station here. Present will be Peg Carr Shaughnessy, Janie’s grand niece. On April 15, 2012, there will be a Memorial Mass at St. Mary’s Church for the repose of the souls of Janie and other Titanic victims. Jane had returned to her native Ireland to care for her family some years prior and she received word that the Windsor Locks Savings Bank had been embezzled by the bank’s treasurer– outstanding citizen Alfred Woods Converse who was bro-in-law to Dr. Burnap. She was returning to settle her bank account when she was lost on the Titanic. Converse suicided the January prior. –Mickey Danyluk , a town historian.